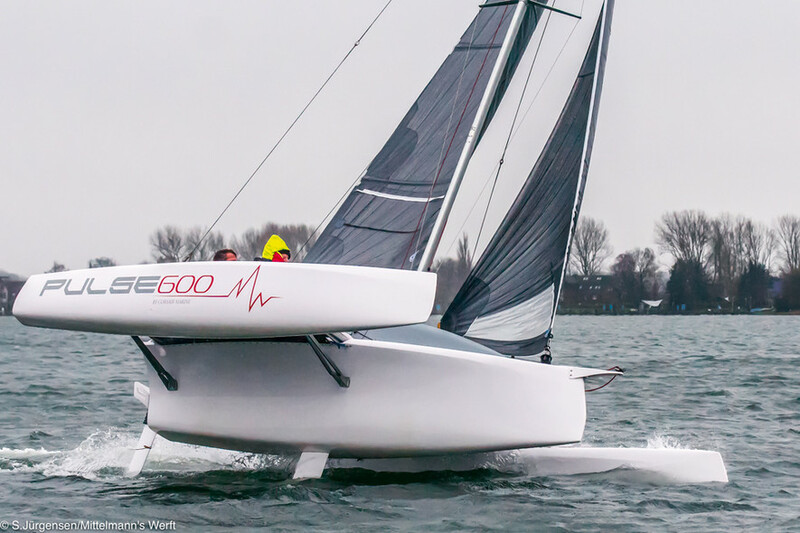 The pulse 600 is a trimaran which remains true to its roots: a real corsair! ItÍs also a boat for family trips where everyone can have great fun. Once the removable roof is lifted off, the extra space forward makes the cockpit even better. The ingenious system for stepping the mast. Two people only need half an hour to get the boat from the trailer to the water. The day boat is an exciting and really fun way of changing to a multihull. Launched only a few months ago, the Corsair Pulse 600 is a boat which is fun to sail and you can take your friends or family out for a trip. An entry-level trimaran and much more besides! Fans of fast multihulls will be familiar with Corsair trimarans which have been admired all around the world for over 30 years, for the ingenious folding system for the arms and for their performance. Ever since the emblematic Corsair 27, the yard has offered numerous multihulls ranging from pure racers to (fast) cruising boats. The pulse 600 is the latest boat from the yard which is now located in Vietnam and which was bought in 2010 by the Australian builder Seawind Catamarans. A boat which can be raced and enjoyed by even the most experienced crews! The first impression you get with the Pulse is that it feels much bigger than the six meters shown on the technical specifications. Notably, the cockpit is very welcoming, being three meters long and 1.45 meters wide. But with the trampolines, this width increases to 4.50 meters, offering a gigantic platform to bring the children along on a trip. At the front of this small trimaran, there is a very practical cuddy which is easy to access to stow your things. The "coachroof" (which is offered in three colors: red, yellow or blue) is removable, allowing you to free up even more space and making the access to the foredeck even easier. An option which will no doubt be favored when racing. So the roof is removable, but once it is fitted, it is completely watertight. The yard also wanted to offer a locker with a watertight lid which is located forward under the coach roof. You can easily stow your belongings here. In order to provide stowage, a large cockpit and good performance under sail on a boat just six meters in length, they had to find a neat trick for fitting the mast. The solution is a structural frame with a hexagonal shape. This means that you can still get into the little cabin and that the mast is solidly and reassuringly supported. Clever. Designed by Franois Perus, the Pulse 600 has a modern look which will be a real head turner in a harbor. The three inverted bows give it an undeniable racing look, which the modern and well cut (North) sails further reinforce. Those who have had the chance to sail on the latest offering from the yard claim that the boat can easily be sailed at the speed of the windƒ WeÍll confirm this in our (forthcoming) test. The racing look was important, but the safety of the boat and the crew was the priority during the development of the trimaran, where the choice of high volume hulls gives minimum risk of tripping up during boisterous runs! In the same vein, the cockpit is self-draining.